Yes, I'm doing a comic book-themed story right off the bat. Had to get it out of my system. It will tie into other current events in the Morgan's world -- you'll just have to wait and see how. This is my comic strip format love letter to EC Comics -- though the comics you'll (eventually) see aren't exactly ECs -- just similar. Some long-time REX readers are upset that I've "retconned" a bit of the strip's history. In my version, the Morgans bought this house, and are not the original owners -- it having been built in the 1950s. This conflicts with the previous writer's version in which the Morgans had the house built. 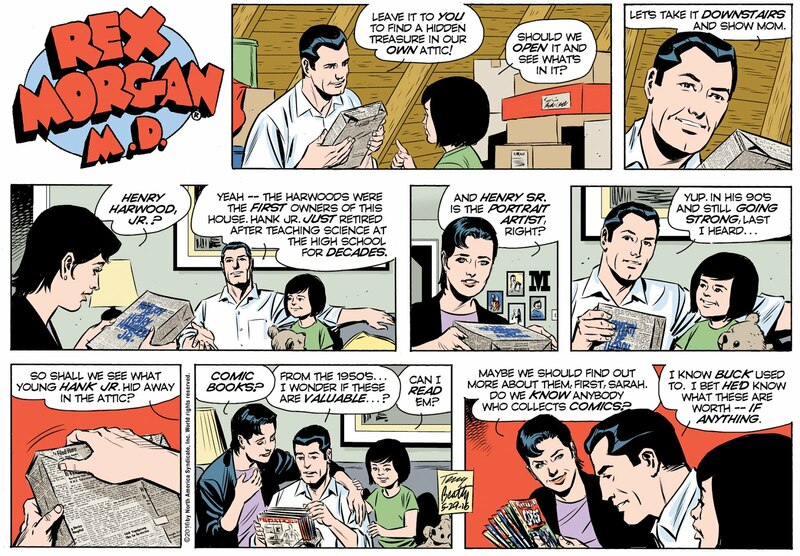 As I've explained elsewhere, the current Rex and June couldn't possibly be the same characters that appeared in the 1950s -- or even more recent decades. They'd be far too old to be still having children, even accounting for "comic strip time." So I figure there have been unannounced "soft reboots" every now and then anyhow -- and I'm doing one now. This one just happens to be announced! I'll stick with the continuity of the past few years -- anything I drew, especially -- but anything more than four or five years ago? As far as I'm concerned, that happened to a Rex and June from some previous comic strip universe. I'm far more interested in picking up where we are today, and moving on from there. I want to tell the best stories I can, and having to juggle decades of largely forgotten and ephemeral continuity does not play into my plans. 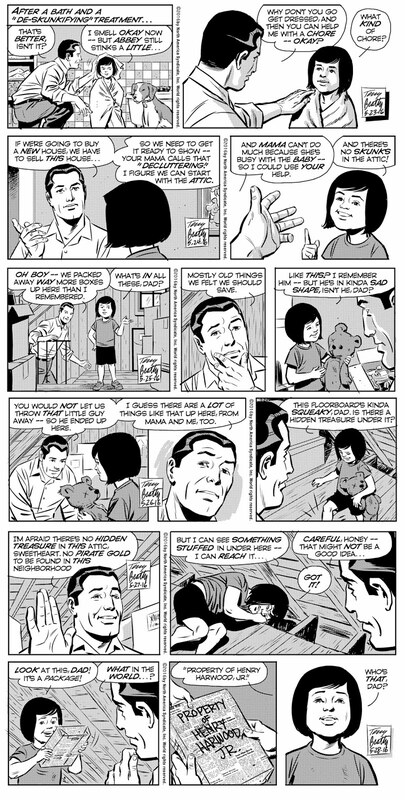 I made an art error in the backgrounds of some of these daily strips -- those floorboards should be running the other way. Mea culpa. And if that's the worst mistake I ever make on the strip, I can live with that. Someday I'll discuss the time constraints under which these strips are produced -- for now I'll just note that those who think I can spend an entire day drawing one daily strip are quite mistaken. I like the direction you are taking the strip so far - it needed a dose of realism. I have a question about why you changed the name of the comics, rather than using the actual EC names. Using the actual names would fall under fair use, wouldn’t it? Do you (and other writers) change the name to avoid any possible legal issues, or do you have other reasons that I can’t think of (perhaps you anticipate writing about a story from the comic that wouldn’t quite fit in the EC genre)? Thanks for sharing your thoughts about writing and drawing the strip. The insider’s viewpoint is very interesting. REX MORGAN 5-16-15 to 5-22-16 -- SKUNKED!